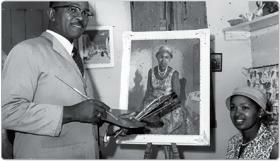 Since his student days, Andrew Nhlangwini has admired George Pemba’s work. Of the memorial he says, "To place an artwork in the public space — rather than hanging it on somebody’s wall — will make people feel that they own it; that it belongs to everyone. Port Elizabeth artist Andrew Nhlangwini is the man behind an impressive memorial, recognising the life and work of celebrated painter George Pemba, which has been installed at the Pemba family home in New Brighton. Using Pemba's original medium, watercolours, Nhlangwini has created a portrait of Pemba with a township scene in the background. The painting was then reproduced electronically and printed on vinyl. Mounted on a 3.5m pole and protected by weatherproof material, it is visible to all who pass by the Ferguson Road home where Pemba lived and worked for 40 years. The home will also be the base of the George Pemba Art Foundation. "To place an artwork in the public space, rather than hanging it on somebody's wall, will make people feel that they own it; that it belongs to everyone," said Nhlangwini, a painter and art lecturer at Nelson Mandela Metropolitan University, who leapt at the chance to take on the memorial project. Best known for his interpretations of traditional African narratives and histories through the language of history painting, Nhlangwini's approach resonates with Pemba's. "Since my student days I have admired his courage and his work - he recorded his people's life through visual images." Like Pemba, Nhlangwini reinterprets and recasts stories of the African past as personal experiences -and his work is a reminder of the often forgotten place of individuals in the objective portrayal of human history. Nhlangwini's 2004 exhibition, The Prophecy of the Cattle Killing of 1856/7, known as the Ibali lika Nongqawuse, propelled him into the spotlight as a painter. Although Pemba received only minimal art training and recognition, he is today regarded as one of the foremost South African artists and his works are highly sought after. Nhlangwini's artwork is both a tribute to Pemba and a means of bringing the memory of the artist into the public domain. "This public art project will be an open-life gallery for South Africans, as well as other people, to see and remember who Pemba was," Nhlangwini said. "I think he would love to see us taking forward what he loved so much." The Pemba memorial is the first in the Eastern Cape commissioned by the Sunday Times as part of its ongoing Heritage Project to erect permanent, public memorials to some of the past century's most remarkable news events and newsmakers. It was unveiled at a small ceremony on March 8 by Pemba's grandson, Bobo Pemba, who also announced the opening of the George Pemba Art Gallery at Pemba's home on April 2.